June 2015 – RallyNews – Patterson Pacenotes Extra's…..
Every now and then, we like to do an update on the status of the notes. It is a pretty busy time at the moment and with so many events on, here is how things stand on Monday, 29 July. We are still posting notes for the ALMC Stages, and this will continue up until Wednesday, 1st July. As the event is a counting round of the RIES MSA Asphalt Rally Championship, most of the crews have already received their notes by mail order. If you still require notes for the rally please do not hesitate to get in touch and we will get them dispatched. There will be some notes available at signing on on Saturday morning, but unfortunately no special orders will be available. We got the Lurgan Park notes made at the end of last week. The first batch of notes and DVDs were posted on Friday. We will continue to post up until Thursday, and of course notes and DVDs can be collected from our office during normal business hours. We will have notes available at signing on in the park on Friday evening and first thing on Saturday morning, but should you require a special order, once again please get in touch and we can get things sorted out for you. The Nicky Grist notes were made last week, and we can report the stage are in great shape for the next round of the BTDRA Championship. There are a few new bits and pieces which are very interesting, but we don’t want to give too much away. We are in the process of finalising the checking process and we will be posting out on schedule on Thursday 2nd July and if possible a little earlier if we can. We are planning to make the Sligo notes this week and providing all goes well, the first batch of notes will be despatched on Friday 3rd July. We have just finished putting together the notes for this years Ravens Rock Rally. Once again the Carrick on Suir MC have chosen three very good stages in the south of the county very close to the seaside resort of Tramore. This year the loop is very compact, the three stages almost circling back on themselves, making it one of the easiest rallies in a while to do a reconnaissance. We reckon, that a loop can be completed in just over one hour with less than ten minutes travel time between the stop of the first stage and the start of the first. In general the stages are quite fast but still have a lot technicality involved, particularly in the high speed sections and places, chicanes are in place to calm things down. Our computer model is predicting average speeds of 113 km/h, 115 m/h and 106 km/h for the three stages respectively. In general the surface is pretty good, but with so many farms on the stages, it will be very slippy if it gets wet. On the upside though, it the sunny south east, and the weather is generally very nice this time of year. The Notes and DVD are ready for posting from today (Thursday 18th June), so call us on ROI 048 28 9084411 or from the UK on 028 90 844111 or order online at our website. www.rallynews.net. 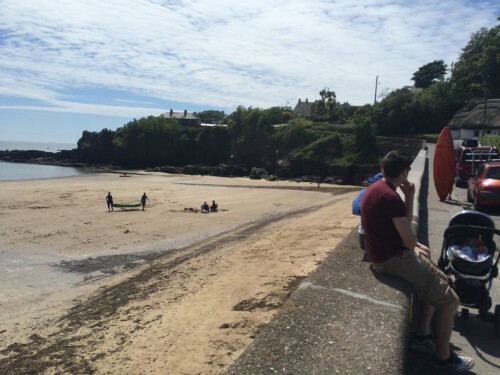 A few lucky people enjoying the beach at Dunmore East when we made the Patterson Pacenotes earlier this week.